Here is today’s live Google Hangout Q&A, plus some thoughts on the running game. Thank you for your questions! Today is a big day. The O-line and running back measurements are key. In particular, we know the Seahawks like their runners to be between 5-10 and 6-0 in height and approximately 210-225lbs in weight. They also like explosive runners — the RB’s will test on Friday. There are no big surprises here among the main group. Sony Michel is a few pounds lighter than expected while Derrius Guice is quite a bit heavier. The expectation was that Michel would weigh 220lbs (perhaps he dropped weight in an attempt to run faster?) while the projection for Guice was about 214lbs. The good news is, that’s a long list of quality running backs that fit Seattle’s apparent preferred size/weight profile. I’m going to spend tonight watching Tennessee’s John Kelly. Despite being expected to weigh about 205lbs, he came in at 216lbs and only a shade under 5-10. He’s a tough runner. Ronald Jones II is lighter and would clearly be a deviation from their previous plan. However, he’s not 190lbs or anything. He’s still reasonably sized at 205lbs for the kind of runner he is. Jamaal Charles weighed 200lbs at his combine. It really depends what Seattle is looking for. The Seahawks could sign a veteran running back before the draft, either to add experience or to act as a hedge. The Panthers released Jonathan Stewart today and he could be an option. Perhaps Carroll will end up working with him after all? Stewart turns 31 in March. The offensive linemen also had a good day, with several showing good size/length. Georgia’s Isaiah Wynn (who won’t work out as he recovers from a torn labrum) isn’t as small as some expected. For me he has a chance to be a Zack Martin level player at the next level. Billy Price has short 32 inch arms that might limit him to center at the next level. It’ll be interesting to see how teams react to that. There’s incredible length and size among this group. Look how many players are in the 6-7/6-8 height range with vines for arms. Jaryd Jones-Smith has a freakish 88 1/2 inch wingspan which is just incredible. Orlando Brown is a mountain of a man and Jamarco Jones has legit tackle size/length. For a full list of results I’d recommend visiting Mike Loyko’s spreadsheet throughout the combine. Plus don’t forget to checkout our extensive combine review. For the last two years we’ve used a formula called TEF to measure explosive physical traits. It proved to be an accurate way of predicting which offensive linemen the Seahawks might be targeting. In light of Tom Cable’s departure (due to his influence on the system) it’s unclear if it’ll be quite as useful in the future. Either way, it’s still a good way to compare the offensive and defensive linemen and measure explosive physical traits. Kirwan’s formula is flawed because it diminishes the impact of the broad jump. A superb 9-7 only achieves a 1.2 point advantage over a below par 8-5. That’s why we developed our own formula (TEF) to essentially do what Kirwan intended — measure explosive traits equally and emphasise their combined importance. Let me make this clear (you’d be shocked how often I have to highlight this) — TEF is not an attempt to determine who is a good or bad offensive linemen. It’s merely a calculation to judge explosive traits. And while that’s only one part of any evaluation — it’s still a relevant part of analysing a prospect or draft class. For a long time we’ve been discussing the league-wide problem of the athletic discrepancy between college O-lines and D-lines. The best athletes are choosing to play defense. TEF helped us define the problem. At the 2016 and 2017 combines, there were a total of 56 ‘explosive’ defensive linemen (explosive = a score of 3.00 or higher). In comparison, there were only nine explosive offensive linemen. It’s a problem that simply isn’t being addressed and the NFL is suffering as a consequence. This appears to be a strong year for interior offensive linemen but a relatively weak year at tackle. Georgia’s Isaiah Wynn and Arkansas’ Frank Ragnow are not performing due to injury. Auburn’s Braden Smith is a name to watch — he’s expected to have an excellent work out and could be one of the stars of the combine. Ohio State’s Billy Price could surprise people with the way he tests. Pittsburgh’s Brian O’Neill struggled at the Senior Bowl but as a former tight end could boost his stock in Indianapolis. They’re likely to prioritise repairing the running game and with an opening at guard, a new O-line coach and the possibility of changes — spending another early pick on an interior offensive linemen appears likely. The big RB story is clear — how explosive is Nick Chubb after his knee injury? It’s clear the Seahawks have a preferred profile and as a consequence, it’s been relatively simple to get a grasp on the running backs they like. Explosive traits, physicality, size (approx. 220lbs) and running style are the key aspects. Christine Michael (220lbs), C.J. Prosise (220lbs), Robert Turbin (222lbs), Alex Collins (217lbs) and Spencer Ware (228lbs) all had similar size, height and athletic profiles. They drafted Prosise and Carson. It’s interesting to note how limited the ‘explosive’ options were in the two previous drafts. We’ll see if this class is deeper and whether the Seahawks will stick to their preferred physical profile or go in a different direction (note: they’d have to deviate to draft Ronald Jones II). The Seahawks haven’t drafted for speed at the position in the Pete Carroll era. They’ve consistently taken running backs in the 4.47-4.55 type of range. Christine Michael (4.54), C.J. Prosise (4.48), Robert Turbin (4.50) and Chris Carson (4.58) were explosive rather than fast. Explosive suddenness and power over straight line speed appears to be the order of the day. The footage will be limited but absolutely it’s the coverage of the vertical and broad jump. Explosive traits are key. It’s nice to see the running backs cutting against pads while showing body control and quickness in the open field. Very few positions though rely on explosive power like running back. How many players fit Seattle’s prototype? That’s question number one before anything else. Saquon Barkley will be highly explosive (guaranteed) but is he as fast as everyone says? Derrius Guice isn’t likely to have a great combine but can he do a lot better than his seriously underwhelming SPARQ performance? Is Ronald Jones II as fast as Jamaal Charles (4.38)? Is Sony Michel more explosive than he was at SPARQ (he needs to be)? With no previous testing info, how explosive/athletic is Kerryon Johnson? Likewise — is Rashaad Penny special or a byproduct of his environment? The most interesting moment though will be Nick Chubb’s performance. At the Nike SPARQ combine in 2013 he had one of the all-time great tests, showing world class athleticism and explosion. He’s since suffered a serious knee injury so it’ll be fascinating to see how different he is physically. Don’t be shocked if he’s back to nearly full power and blows the roof off Lucas Oil Stadium. Simply put, they have to tap into this running back class. Seattle’s running game has collapsed and while the national media is focusing on defensive backs galore — the big need for this team is to finally get the running game going again. There’s little point focusing too much on the quarterbacks here unless it’s to keep an eye on who Arizona might trade up for. We’ll see if the big names work out (Darnold, Rosen, Allen, Mayfield, Jackson). Arm strength and accuracy are judged in the throwing drills and it feels like there’s a big opportunity for these players to move up boards. The Seahawks have only drafted one quarterback in the Pete Carroll era (Russell Wilson). Kenny Lawler (4.64) and Chris Harper (4.50) are the only receivers they’ve drafted who didn’t run in the 4.4’s. Paul Richardson (4.40), Golden Tate (4.42), Tyler Lockett (4.40), Kris Durham (4.46), Kevin Norwood (4.48), Amara Darboh (4.45) and David Moore (4.42) all cracked the 4.4’s. 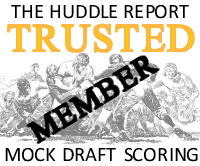 Kris Durham (216lbs), Chris Harper (229lbs), Kenny Lawler (203lbs), Amara Darboh (214lbs) and David Moore (219lbs) are the only five receivers drafted that were +200lbs. They might be on the look out for a bigger target this year, especially if Jimmy Graham moves on. Some of his red zone production will hopefully be shifted onto the running game but having found an effective weapon there, they’ll want at least one big body to throw at with a short field. The best non-FA athlete Seattle has acquired in the Carroll/Schneider era was an UDFA — Ricardo Lockette. He ran a 4.41, had a 39-inch vertical and a 6.76 three-cone. He was also well-sized at 211lbs with 33.5-inch arms. The Seahawks have been comfortable bringing in high-ceiling UDFA receivers, finding success with Lockette, Doug Baldwin and Jermaine Kearse. If they’re really going ‘back to the future’ to reload this team, they might be looking for another cheap receiver to replace some of the ‘bigger name’ targets of recent years. Any drill that clearly shows the receiver’s catching technique. It’s extremely important. Only when you watch the drills do you realise how many bad habits these receivers have. You want to see a wide out cupping his hands and showing them to the ball. No alligator arms, no fighting the ball or snatching at it. Watch the downfield throws too and see who is good at high pointing the football, showing body control. It’s a pretty ‘meh’ group of receivers overall. The value in the early rounds isn’t great and is likely to be better between rounds 3-7. LSU’s D.J. Chark was one of the standout performers at the Senior Bowl. It’ll be interesting to see how Washington’s Dante Pettis performs. Is Maryland’s D.J. Moore slow? He’s a tenacious, physical receiver but is he quick enough? How fast is T.Y. Hilton clone Keke Coutee? How will some of the bigger guys like Auden Tate, Javon Wims, Marcell Ateman, Simmie Cobbs Jr and Jaleel Scott perform? Can USC’s Steven Mitchell show well and can Anthony Miller ease some of the concerns about his athleticism and injury history? Plus how will teams view problem child Antonio Callaway during interviews? He’s immensely talented but can you trust him? With Paul Richardson a free agent, Tyler Lockett a year away from free agency and Amara Darboh having an ineffective first season, this could be a position of interest. The crop of free agent receivers could be more appealing but expect at least one wide out to be drafted. They could use a big, athletic target. The three tight ends Seattle’s drafted — Nick Vannett, Luke Willson and Anthony McCoy — are all quite different. Vannett was considered a throw-back style blocker with some pass-catching potential. Willson ran a 4.51 at his pro-day with a 38-inch vertical. McCoy ran a 4.78 but was familiar with Carroll and had great size and big mitts. This is one of the more unpredictable positions to judge for Seattle. They tried to turn Jimmy Graham into the ‘complete tight end’ but settled on making him a red zone machine in 2017. If Graham moves on, do they look for an athletic replacement or another ‘Y’ tight end? This TE class isn’t like last years. It’s possible we won’t see a tight end drafted in the first two rounds. We might not see a truly dynamic athlete like O.J. Howard, David Njoku or George Kittle either. In 2010 when Jimmy Graham was drafted in round three by the Saints — the following players left the board between pick #95 and Seattle’s next pick at #111: Everson Griffen, Alterraun Verner, Darrell Stuckey and Geno Atkins. The Seahawks took Kam Chancellor at #133. The 2010 draft had some depth. There’s very little to gain by watching the blocking drills so like the receivers, check out a players catching technique. Is he cupping his hands and showing to the football, or is he fighting the ball? If the Seahawks are looking for an athletic replacement for Graham, players like Ian Thomas at Indiana or Mike Gesicki at Penn State could be in play. For the most part this is not a good class of blocking tight ends. Unsurprisingly, the two schools that still utilise orthodox ‘Y’ tight ends and focus on the running game have produced two possible options. Stanford’s Dalton Schultz is a tremendous blocker especially in the running game and could easily be a Seahawks target. How long are his arms and how athletic is he? Notre Dame’s Durham Smythe had an excellent Senior Bowl and is also an adept blocker. He had short arms at the Senior Bowl but how accurate was the measurement? These measurements have a habit of changing at the combine. Those are the two names I’ll be focusing on the most, alongside Washington’s Will Disly and Florida State’s Ryan Izzo. Very important. At the moment the only contracted tight ends in Seattle are Nick Vannett and Tyrone Swoopes. Luke Willson could return but the writing appears to be on the wall for Jimmy Graham. They could sign a free agent but another ‘Y’ tight end like Schultz or Smythe could be the order of the day in the middle rounds. The Seahawks do appear to have defined preferences at each of the different positions. For example, Seattle hasn’t drafted a defensive lineman or EDGE rusher with sub-33 inch arms. Quinton Jefferson, Jordan Hill, Jaye Howard and Malik McDowell all tested superbly in the short shuttle (4.37, 4.51, 4.47 and 4.53 respectively). If they’re looking for a quicker, interior pass-rush option — this drill appears to be significant. The splits are also important for inside/out rushers or interior pass rushers. Frank Clark was considered more of an explosive inside/out rusher and he ran a 1.69 split at 271lbs. Malik McDowell managed the same 1.69 split at 295lbs. Dynamic quickness is a trend for EDGE players. Bruce Irvin (4.03) and Frank Clark (4.05) both ran incredible short shuttles. Cassius Marsh’s 4.25 and Obum Gwacham’s 4.28 were also really good. There were serious concerns about McDowell’s effort and attitude but he put on a show at the combine. He’s 295lbs with great height (6-6) and length (35 inch arms) and ran a 4.85 with a 1.69 split. His three cone (4.53) was the same as Dalvin Cook’s. Of all the positions not to overreact to, D-line might be one of them. For whatever reason, pass rushers seem to last. We spent a lot of time in 2011 talking about Justin Houston as a possible LEO target. He lasted into round three. A year ago Kansas State’s Jordan Willis had a fantastic workout and also lasted into round three. His 1.54 10-yard split was the best for a +250lbs player since Cliff Avril’s 1.50. This is worth taking into account if someone like Rutgers’ Kemoko Turay has a great combine. He might get talked up a lot — but he could still last into the middle rounds for a team like Seattle in clear need of adding a LEO. The Seahawks have only drafted 5 players with a +140 SPARQ score. Christine Michael (150), Kevin Pierre-Louis (149) and Bobby Wagner (147) were the only three to beat Bruce Irvin (144) and Frank Clark (142). Just absorb everything. The D-line drills are the most entertaining, most fan-friendly of all the combine events. The bag drills, the swim/rip drills, the club, the working in space. It’s a real show of the most explosive athletes in college football competing in one venue. Rutgers Kemoko Turay and Georgia’s Lorenzo Carter are two LEO or SAM possibilities but both are working out with the linebackers. Is Bradley Chubb as impressive physically as his cousin Nick Chubb? How big is Tim Settle and how does he perform at his size? Florida State’s Josh Sweat had an incredible SPARQ workout and if he’s healthy, could be one of the stars of the weekend. Vita Vea will confirm his top-10 pick status when he runs a sub-5.00 forty. What shape is Arden Key in? Can Marcus Davenport secure a place in the top-20? How big/long is Maurice Hurst and what is his 10-yard split? What kind of athletes are Dorrance Armstrong and Jeff Holland? Is Sam Hubbard more than an average athlete? How much potential does Da’Shawn Hand possess? Can Tyquan Lewis and Andrew Brown, two Senior Bowl standouts, boost their stock? USC’s Rasheem Green could put on a show (his short shuttle should be epic) and how much potential does Taven Bryan truly have? There’s so much to discover with this group. It depends what happens over the next few weeks. If they move on from Cliff Avril, Michael Bennett and Sheldon Richardson, this becomes a huge need area. And who knows what’s happening with Malik McDowell? At the very least it feels like they need to add a LEO. The Seahawks have drafted a collection of freakish athletes at linebacker since 2010. Kevin Pierre-Louis, Korey Toomer, Malcolm Smith and Eric Pinkins all ran between a 4.44 and a 4.51 in the forty. KPL, Smith and Pinkins all jumped +39 inches in the vertical. Bobby Wagner was a 4.4 runner at his pro-day with a 39.5-inch vertical. Of the five players they’ve drafted with a +140 SPARQ score, Wagner, KPL and Bruce Irvin are included. Speed (forty yard dash) and explosive traits (vertical, broad) appear to be preferred. It was interesting a year ago that Seattle avoided the linebacker position in the draft despite Pete Carroll’s insistence that they needed to add some youth at the position. The 2017 combine didn’t produce many exceptionally quick or unique athletes. Instead they turned to free agency. It’s highly possible they will now review this position again, assuming the options are better in what looks like a much deeper and more impressive linebacker class. Bobby Wagner played 99.35% of the defensive snaps in 2016 and K.J. Wright played 97.41%. We asked a year ago how sustainable this was and both players missed time or played through injuries in 2017. Wagner tallied 93.08% of the snaps and Wright 87.07%. They need some depth and help at the position. The short shuttle results. We highlighted a year ago how important it might be for the Seahawks. Quickness and change of direction is vital at linebacker. It’s a really impressive group this year. Tremaine Edmunds and Leighton Vander Esch could secure top-20 placings with a big performance. Roquan Smith will need to test well at his expected size (6-0, 225lbs) to get into a similar range. Alabama’s Rashaan Evans knows he’ll secure a first round slot with a good combine. 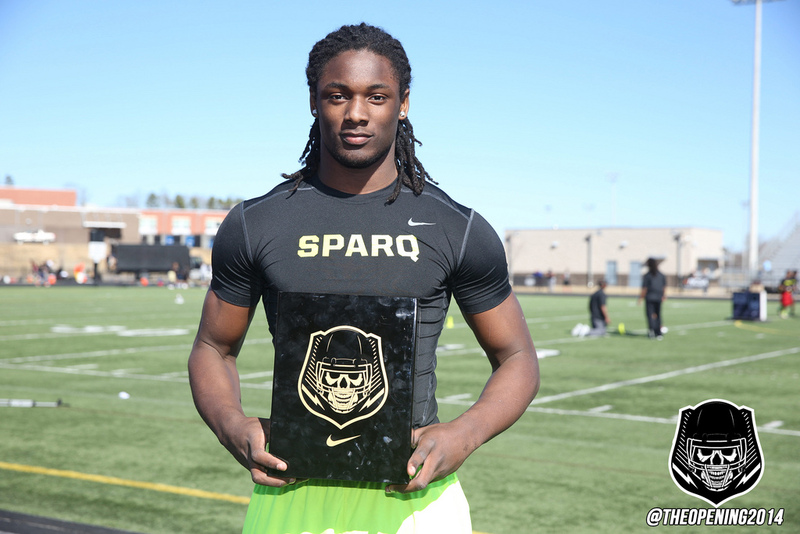 Texas’ Malik Jefferson had a sensational SPARQ combine and could be one of the stars again in Indianapolis. South Carolina State’s Darius Leonard was a standout at the Senior Bowl and could further boost his stock with a great workout. Ohio State’s Jerome Baker needs to run well at 6-1 and 225lbs. Washington’s Keishawn Bierria might want to send a ‘don’t forget about me’ message to the league. Two other players to watch out for could be SAM/LEO prospects. Rutgers’ Kemoko Turay will test with the linebackers but is more of an EDGE rusher. He looks like a LEO candidate and his 10-yard split will be vital. Georgia’s Lorenzo Carter is more of a SAM/LEO and he’s extremely explosive (40 inch vertical is possible). However, he isn’t the quickest so his 40/10 will be key. They need to support Wagner and Wright while also looking at the SAM/LEO position. This is a really good year for the Seahawks to add some much needed young talent to the linebacker position. A year ago this was the highlight of the combine. The cornerback class was the talk of the NFL. In 2018 that most certainly isn’t the case. It’s a pretty average looking group. By now everyone knows what the Seahawks like in a cornerback. Every corner drafted in the Pete Carroll era has had 32 inch arms. Those players are generally physical and tall and take pride in defending the run. We’ve previously discussed the importance of wingspan too. Wingspan is defined as the length between the tip of your middle finger on one outstretched arm to the other. The average NFL cornerback has a wingspan of 75.5 inches (31.5 inch arm length). In 2017 they drafted Shaq Griffin in round three. He has 32 3/8 inch arms but only a 74 3/4 inch wingspan, so this was quite a difference compared to some of the other corners. Generally speaking though, they might stick to a better than average wingspan. Short-area quickness also seems to be important. The short shuttle tests lateral quickness, explosion in short areas, body control and the ability to change direction quickly. LSU’s Kevin Toliver has a reputation for being a bit ego-driven and he didn’t live up to his recruitment hype. Yet he’s perfectly sized at 6-3 and 204lbs and he’s a former 5-star recruit. With the right type of guidance he could be a nice project for Seattle’s staff. Texas’ Holton Hill, Virginia Tech’s Brandon Facyson, Boston College’s Isaac Yiadom, Stanford’s Quenton Meeks and Auburn’s Carlton Davis could also fit Seattle’s size profile. We’ll post a full list of the cornerbacks that fit the bill for the Seahawks in terms of size/length before the CB workouts. With Richard Sherman’s future in question and the possibility of major change coming on defense, it seems likely the Seahawks will do what they nearly always do — draft a corner on day three and coach them up. After hitting on Earl Thomas and Kam Chancellor in 2010, Seattle hasn’t had much success drafting for the safety position. Ryan Murphy, Winston Guy and Mark LeGree have come and gone. Delano Hill and Tedric Thompson didn’t see much action in 2017 despite injuries to Earl Thomas and Kam Chancellor. There’s a real mix of physical profiles too. Thomas (31 1/4) and Legree (30 1/4) have short arms so the 32-inch test isn’t necessary here but Guy had great arm length (33). Murphy ran a 4.48 at his pro-day with an impressive 39-inch vertical but Legree (4.59) and Guy (4.70) didn’t run fast times (Legree only had a 31-inch vertical too). Hill ran a 4.47 but Thompson managed only a 4.60. Overall it’s hard to determine a Seahawks ‘type’ with these numbers. The only safety they’ve drafted in the first two rounds (Earl) is a tremendous athlete. He ran a 4.37 at his pro-day after pulling a hamstring running the forty at the combine (while still managing an official 4.49). The 2018 draft class at safety is a little overrated in the national media. Minkah Fitzpatrick is regularly mocked in the top-five but is more likely to go in the 10-15 range. Derwin James is physically explosive and looks the part but didn’t make many game-tilting plays for Florida State. Deshon Elliott is also a little bit overrated and Ronnie Harrison, while perfectly solid and sound, doesn’t have an outstanding or unique aspect to his game. The Seahawks are at a bit of a crossroads at the position. They might need to replace Earl Thomas and Kam Chancellor. They might re-sign Bradley McDougald and extend Thomas’ contract. They could also look at Eric Reid in free agency. So they essentially could be going into this draft needing to bring in at least one, if not two starters. Or they might be able to ignore the safety class altogether. Any of the drills requiring the safety’s to close in space and show off their open-field quickness. If they’re possibly moving on from Earl Thomas, they’re going to need some speed in the secondary. Wake Forest’s Jessie Bates III might be the best option if they suddenly need to draft a free safety. Make sure to keep an eye on his workout. There are two famous brothers to watch too. Terrell Edmunds is Tremaine Edmunds’ brother and has good size to potentially work at strong safety. Meanwhile Stanford’s Justin Reid is the brother of San Francisco safety Eric Reid. A lot of eyes will be on Derwin James and Minkah Fitzpatrick. My personal predictions are — James will be extremely explosive with outstanding size but not quite as quick as people expect, while Fitzpatrick will have one of the better performances among DB’s. It all depends on what happens at the start of the new league year. Do they trade Earl Thomas? Do they re-sign Bradley McDougald? Do they sign a free agent? Does Kam Chancellor retire? There’s so much that needs to be determined here. Pete Carroll is scheduled to speak to the media on Thursday at 9am PST. John Schneider will conduct a press conference on Friday at 8am PST. As usual we’ll be live-blogging during each day of the combine with instant analysis and a review at the end of each workout. I hope you’ll join us! I wanted to put this down before the combine — then reflect on it afterwards to see what has changed. Some of the names below contain hyperlinks. The links take you to individual articles written about the player in question. So if you want more info/opinion, click on the name. The five freakish difference makers in the class. Barkley could be the most explosive offensive player to enter the league in a generation with a jump-cut to die for. Nelson will likely have a Steve Hutchinson impact on the league. Edmunds is the most unique player in the class — incredible size, length, versatility. There isn’t another player like him in the league. Chubb has the same bloodlines as cousin Nick and we know how incredible he is as an athlete. Vea’s mobility and quickness at 340lbs is shocking and can only truly be appreciated watching him live. All five players should go in the top-10. The quarterbacks both have talent and upside but some question marks. Darnold has incredible potential but isn’t anywhere near as refined as DeShaun Watson a year ago (Watson was criminally underrated pre-draft by the media). Rosen technically looks the part but there are questions about his personality. Jones II is a Jamaal Charles clone and a player with legitimate star quality. An exceptional prospect. Price is intense, plays with occasional reckless abandon and goes after the opponent. He sets the tone up front. Wynn reminds me of Zack Martin at Notre Dame. He isn’t the biggest, he isn’t the most explosive or athletic. He is just really fundamentally sound and tough to beat. He doesn’t make mistakes. Settle won’t run like Vita Vea and he doesn’t carry his weight as well. Yet as a pass rusher it’s quite incredible to watch a player of his size swim/rip like he does, not to mention his excellent get-off. He’s the best 330lbs pass rusher you’ll see in a long time. Maurice Hurst is a classic three-technique with great quickness off the snap, solid hand-technique and a consistent ability to impact games from the interior. Players like Hurst are rare. Jackson has a rocket arm, showed major improvement as a touch passer in 2017 and is capable of being a Michael Vick-style playmaker. He is Vick. And for some reason people aren’t giving him his dues. Fitzpatrick on the other hand is the opposite — a little bit overrated — and more likely to go in the 10-15 range than the top-10. Vander Esch is a modern day linebacker. He has the size to play inside at middle linebacker in any scheme, the range and mobility to run to the sideline and the instinct to be a major playmaker. In a couple of years he could be up there with Wagner and Kuechly as the best in the game. Smith gets a lot of top-15 love but you have to remember — he’s not a burner and he’s going to weigh about 225lbs. I like him as a player but we have to acknowledge he won’t fit every team or scheme. Smith will be a first rounder and likely a very useful pro but probably won’t go as early as some are projecting. Bryan has incredible upside and while he might need a redshirt year to work things out, he has inside/out rush ability and the potential to be an absolute game-wrecker. I watched some of Green this week and came away impressed with his physical potential. Whether he can take it to the next level and continue to grow remains to be seen but he has sensational size and length and carries his weight extremely well. He ran a 4.44 short shuttle at the Nike combine at 290lbs and achieved a 113.04 SPARQ rating. He could be a big time riser after the combine. James will likely have an explosive combine too — testing well in the jumps. Yet he is what he is — a box safety that didn’t impact many games with big plays. I’ve said before, his tape is a bit boring. He has appealing character traits and size. He’ll go in round one. How early remains up for debate. Davenport didn’t perform as well as hoped at the Senior Bowl and came across as a bit shy and retiring. He too might need a redshirt year and strong coaching/guidance. Yet his tape and physical ability warrants a first round pick. Payne is the strongest D-line prospect in the class with the size and bulk to act as a key run defender. He showed, especially in the two Playoff games, he also has some pass rush potential. Johnson (when healthy) was leading Auburn to a possible National Championship. His upright running style could invite injury and he’s not the quickest but he runs with authority, he’s tough and he has fantastic patience in the backfield. Evans plays with his hair on fire and doesn’t hit, he hammers opponents. The combine will be crucial for his stock. He’s likely a late first rounder. Ridley isn’t big or particularly fast but he’s adept at getting open and he’s consistent. Mayfield won the Heisman and is clearly a playmaker but he lacks the physical tools of the other top quarterbacks available. — The Seahawks were not awarded any comp picks today. — Ian Rapoport is reporting they’re more likely to sign a new deal with Earl Thomas than trade him. He also suggests Richard Sherman isn’t healthy enough to deal. I don’t know about you but I’m ready to just know what’s going on one way or another. Ever since the 42-7 embarrassment against the Rams there’s been talk of major change to the defense. I still think that’s likely. The idea of just patching things up, trying to get through another season and having 8-10 players not practising every week is unappealing. Change feels inevitable — it’s the level of change that needs to be determined. And considering we’ve gone from minor speculation that Kansas City might be willing to trade Marcus Peters to a deal being done with the Rams in the space of about 48 hours, it’s starting to become pretty difficult to garner anything from the speculation. — There are still key reasons why I think change of some kind is likely. The defense does need to get younger and cheaper. This hasn’t felt like the Seahawks of 2011-14 for a while now. The group of fiery players that were pissed off for greatness became, well, great. They got paid. And after the New England Super Bowl they arguably channelled their anger inwards rather than outwards. The running game has collapsed. They lost a lot of the intensity and identity that made them great and increasingly started to lean on Russell Wilson as the injuries piled up. Proper competition has to return. That upstart nature has to return. They’ve been trying for two years to be the bully again and it’s just not happening. If they want to get back to that it’s going to take more than the window dressing of 2016 and 2017. They can’t just keep rolling on, hoping the next iteration of Eddie Lacy will halt the decline of a team that has gone from 13 to 12 to 10 and then to 9 wins in the space of five years. — If they do ultimately end up retaining Thomas, Sherman and players such as Michael Bennett, it’ll reinforce how likely it is they address the running game as a priority this off-season. They could bring in a hedge running back via free agency (eg Carlos Hyde) and consider the situation at safety (Bradley McDougald? Eric Reid?) before looking at the options at receiver. These moves could set them up to tap into the strength of the draft early (OL, RB, LB) and target a possible LEO edge rusher in the middle rounds (Kemoko Turay?). — If they don’t acquire extra picks by moving veterans, trading down from #18 becomes a foregone conclusion. They’d have little choice, right? Picking once in the first four rounds seems unlikely. Trading down more than once could be an option too. Negotiating such a deal and still finding a way to come away with one of Billy Price, Isaiah Wynn or Ronald Jones II would be a win. It’s unclear how likely it is though. — If they had their picks in rounds 2-3 you might be more inclined to think about defense in round one. Michigan’s Maurice Hurst, for example, is the type of dynamic interior pass rusher this team has really lacked. Instead they might end up trading down with a team like Atlanta so the Falcons can get Hurst. — Having as many picks in rounds 2-3 as possible is critical this year (the area where the Seahawks currently have a bare cupboard). While the likes of Price, Wynn and Jones II are appealing first round options, if you only manage to acquire one third rounder you’ll be really limiting yourself. Ideally you take a running back in the top-75 (you’ll be kicking yourself BIG TIME if you don’t this year) and you want to hit OL/RB/LB as early as possible. Yet in the third round you might want to get Rutgers’ Turay to be your LEO or Stanford tight end Dalton Schultz to really bolster your run blocking. — It’s only when you start to write all this down that you realise how much needs to be done and how little draft stock and cap room Seattle has to really address it all. They’re not in a bad position (and won’t be as long as they have the likes of Russell Wilson and Bobby Wagner) but certain decisions (and some mistakes) are starting to catch up with the Seahawks. Big combine preview on the way Sunday or Monday. Keep an eye out for it. Let’s call this a first draft because we’ll receive so much information at the combine. We need to know 10-yard split times for the LEO candidates, short shuttle times for the linebackers, length and size for the cornerbacks and a lot more. The Seahawks could do with adding a LEO. They need quickness off the edge. Rutgers’ Kemoko Turay could be the ideal player for the role — with excellent get-off, at least some evidence of good hand technique and a great athletic profile. He looked explosive at the Senior Bowl and has a ton of potential. If the Seahawks are able to acquire extra picks in the third or fourth round range, Turay could be a key acquisition. It’s going to need to be someone with good length, a really quick 10-yard split and overall high athleticism. The 1.50-1.59 splits are the ones to look out for at the combine. There won’t be many but if Turay manages it at 6-5 and 252lbs he could quite easily be a Seahawks target. Alternatives at LEO? Boston College’s Harold Landry could be targeted albeit with a much earlier pick. We know Florida State’s Josh Sweat is a fantastic athlete. If you’re comfortable with his injury history, he’s another option. Sweat ran a 4.46 at 240lbs at the SPARQ combine. What else might they need? It’s hard to say. If Malik McDowell returns there’s every chance he could fill the void left by either Sheldon Richardson or Michael Bennett. Dion Jordan equally has some inside/out ability now he’s added size and Frank Clark isn’t small either. If you knew all three would be healthy and available going into camp you might feel quite comfortable about the situation. There’s very little news on McDowell however and Jordan missed most of the 2017 season. NC State’s Kentavius Street could be a possible three-technique option. He’s about 280lbs these days but what an athlete. At the SPARQ combine he ran a 4.70, managed a 36-inch vertical and a 4.44 short shuttle. His SPARQ score was 115.41. He’s said to be an even better athlete these days too, plus he’s a former four-star recruit. He’s being projected as a late rounder and could be someone the Seahawks want to work with. Ohio State’s Tyquan Lewis is no slouch and he had a good showing at the Senior Bowl. He scored 108.57 at the SPARQ combine including a 37 inch vertical. He’s a possible inside/out rusher who could last as he had to operate in a heavy rotation with the Buckeyes. He’s also someone who could develop into a leader. Auburn’s Jeff Holland lacks an attractive physical profile but plays with intensity and skill. Virginia’s Andrew Brown is another prospect with upside who could be available on day three. A former five-star recruit he also performed well at the Senior Bowl. He managed a 103.11 SPARQ rating in High School and ran a 4.47 short shuttle at 295lbs. The Seahawks have also shown they’re adept at finding veteran talent on the defensive line over the years. So on top of the options in the draft, there’s every chance they’ll bring in some options in free agency too. We’ll need to see how the players measure at the combine. The Seahawks have stuck to a strict body type since 2010 and that isn’t likely to change. Whatever happens with Sherman, the Seahawks could do with adding another cornerback in the round 4-7 range this year to train up. Despite many of the national mock drafts touting a cornerback to Seattle in round one, the chances are remote at best. They haven’t taken a CB earlier than the late third round under Pete Carroll. There’s very little reason to believe that’ll change this year. It won’t even be a position of significant need if they retain Sherman and re-sign Maxwell (hardly improbable scenarios). The Seahawks believe in their (proven) ability to develop young cornerbacks without spending high picks. That simply won’t change unless they’re picking in the top ten and happen to see a Jalen Ramsey or Patrick Peterson waiting for them. LSU’s Kevin Toliver is said to be 6-3 and 203lbs with good length. He’s a former five-star recruit who never really lived up to expectations in college. According to his NFL.com bio, Toliver has “an entitled attitude” and a big ego. It could put a lot of teams off, including the Seahawks, but they did draft Tharold Simon who similarly faced criticism for his time at LSU. It’s unusual for a player with Toliver’s potential to last into the round four range but if he does, they might see him as a project worth taking on. He’d be a nice challenge for a team with Seattle’s development chops. Texas’ Holton Hill also possesses size, length and undelivered potential. He could be another attractive project. Virginia Tech’s Brandon Facyson also looks the part. He had a very strong start to his college career but a broken leg stalled his progress. He could be one of those players that falls a bit further than he should and provides some value. This isn’t about replacing anyone, rather than bolstering the ranks. Bobby Wagner and K.J. Wright need some help. And we saw what happened when Wagner wasn’t full-go and Wright was absent against the Rams. They could also do with adding a SAM/LEO type if possible. Georgia’s Lorenzo Carter could be an option. At the Nike SPARQ combine he managed a 40-inch vertical at 6-5 and 234lbs. He’s highly explosive and athletic, posting a 129.75 SPARQ score. He’s not necessarily the quickest though (4.63 at the Nike combine) so his short-area quickness testing and 10-yard split could be crucial. Another option could be South Carolina State’s Darius Leonard. Few bolstered their stock like Leonard at the Senior Bowl. He excelled in coverage drills against smaller, quicker running backs and had a couple of ferocious hits too. He has +34 inch arms and we know they really liked K.J. Wright for his length. Leonard looks and sounds like he’s ready for battle and could be a fantastic project for Ken Norton Jr.
Other options include Texas’ Malik Jefferson (who could be the combine’s big winner after his sensational Nike test) and Ohio State’s Jerome Baker. It’s a really good looking group of linebackers though. The combine will be fascinating and crucial. This is a position that seems to be thick throughout the draft and there will be attractive day three options to go with some of the early round studs. It’s hard to get excited about this safety class and you can forget about replacing either of Seattle’s two legends. There probably won’t be another Earl or Kam. They’re unique people and players. If the Seahawks have to replace both, they’ll likely adjust their scheme to compensate. The safety class is littered with players you kind of like but don’t love. Derwin James is a great athlete but his tape is boring and it’s a hard sell to draft a box safety in round one who doesn’t make a lot of big plays. He’s the popular pick for Seattle in mock drafts and there’s no doubting his athleticism and size. Is he worth their first round pick? They’d have to believe he was a true ’tilt the field’ player to justify it. There’s a reason why they’ve only taken one defensive back in the first two rounds of the draft since 2010 (Earl Thomas). Minkah Fitzpatrick is a bit overrated. Ronnie Harrison is perfectly fine as a prospect but might go earlier than warranted. Wake Forest’s Jessie Bates III is probably the most intriguing player. He’s quick, clearly does his homework, understands the opponent and had a number of big plays as a redshirt freshman. He isn’t Earl but he could end up being a reliable starting safety. He’s consistent and disciplined which is important in Seattle’s scheme. Virginia Tech’s Terrell Edmunds could be one to watch. He’s Tremaine’s brother and has good size (6-2, 220lbs). It’s also worth remembering the Seahawks could keep Bradley McDougald and only last year drafted Tedric Thompson and Delano Hill. San Francisco’s Eric Reid could be an option as a free agent too. We did this a year ago. Time for the 2017 version. — Nothing should be off the table. The Seahawks finished 9-7 for a reason and it wasn’t just down to a few missed field goals by Blair Walsh. Changes to the defense appear to be inevitable but practically anything should be considered, especially if it helps repair the struggling running game. This is a vital off-season. — Get younger on defense. According to ESPN the Seahawks fielded the fourth oldest defense in the NFL in 2017. In comparison, they had the second youngest offense. The injuries are starting to pile up, fewer players are practising during the week. This has to change in 2018. — Get cheaper on defense. The Seahawks are paying a disproportionate amount of money to their ageing unit. In 2017 the Seahawks spent $93,714,666 on their defense, more than any team in the NFL. The split between offense and defense was 36.37% vs 55.98%. They spent $60,885,063 on the offense — 29th highest in the league. Of the 12 biggest cap hits on the roster, nine were defensive players. The three offensive players were Russell Wilson, Jimmy Graham and Luke Joeckel. Graham and Joeckel are both free agents. There has to be a greater balance in spending between the two units. — Prepare to make a tough call on Earl Thomas. The Seahawks can’t afford a long drawn out battle. Do they believe they’re going to get their money’s worth from a big extension? If they have doubts or if Thomas simply asks for too much money, they have to be willing to see what’s out there via trade. One way or another a big decision is coming. Earl will either sign a contract extension before the draft or he’ll be traded. — Check out the market for Richard Sherman. A year ago the Seahawks made it quite clear they were willing to listen to offers for Sherman. It’s worth reviewing the situation again. His age, injury and contract status might not scream ‘trade value’ but if this is his last year in Seattle anyway, you might as well see what’s out there. A weak cornerback draft class might aid the situation. — Dion Jordan, Justin Coleman and Bradley McDougald all performed well in 2017 and should be retained. Jordan and Coleman are restricted free agents and it’ll be fairly straightforward to keep both. McDougald is an unrestricted free agent but played well filling in at both free and strong safety. With uncertain futures for both Earl Thomas and Kam Chancellor, they could do with keeping McDougald around. — Come up with a solution to the Sheldon Richardson dilemma. They could transition or franchise tag him, essentially providing another ‘prove-it’ situation for Richardson. They could let him walk and hope to get a decent comp pick. They could let him test the market and hope to re-sign him for a reasonable amount. Richardson is clearly talented but it’s difficult to project how the Seahawks will approach his future. — Acquire extra picks. The Seahawks can’t afford to pick once in the first four rounds of the draft. There’s too much work to do. One way or another they need more. Either trade some veterans or trade down from #18. Or both. — ‘Value’ and ‘opportunity’ should be the two key words in free agency. No big splashes. Firstly, to protect any worthwhile 2019 comp picks. Secondly, it’s time to work this roster 2010 style. The Seahawks need to start looking for the next core. A highly competitive environment is required, with players fighting to prove a point and get the opportunity to earn big money. Seattle has carried too many big contracts in recent years and they need to rekindle some of that scrappy, gritty personality. — The San Francisco pair of Eric Reid and Carlos Hyde could be acquired. Reid is every bit as athletic as Derwin James but some teams might be put off by his connection to the protest movement. That won’t be an issue in Seattle and he could be willing to sign a one or two year ‘prove-it’ deal to play strong safety. Hyde would be a perfect hedge for the draft and might be cheap given his age and production. Another option could be Marqise Lee. In a competitive receiver market, Lee could be forced to sign a one-year deal similar to Alshon Jeffery and Terrelle Pryor a year ago. — The strength of the draft in the early rounds is clear — OL, RB, LB. The Seahawks might take one of each if they acquire extra picks. The third day of the draft appears set to provide some value on the D-line and secondary. So use the early picks to finally repair the run and consider either some help for Bobby Wagner and K.J. Wright or a SAM/LEO. — Seriously consider selecting Billy Price, Isaiah Wynn or Ronald Jones II with your first pick. These three players stand out in a big way and would significantly boost Seattle’s offense and running game. Repairing the run has to be a key priority this off-season. — Adding a LEO also seems crucial, especially if Cliff Avril departs. There are options in this draft. If they want to take one early, they could look at Boston College’s Harold Landry. Rutgers’ Kemoko Turay and Georgia’s Lorenzo Carter could be good options in the middle rounds. Keep an eye on the 10-yard splits at the combine (especially anyone who runs in the 1.5’s). — Make a point of drafting another ‘Y’ tight end. Jimmy Graham and Luke Willson are both free agents so this position requires some attention. The jury’s still out on Nick Vannett. They could look for another athletic mismatch in the passing game or a red zone dynamo to replace Graham but if they’re serious about fixing the run — another in-line TE who can block wouldn’t go amiss. 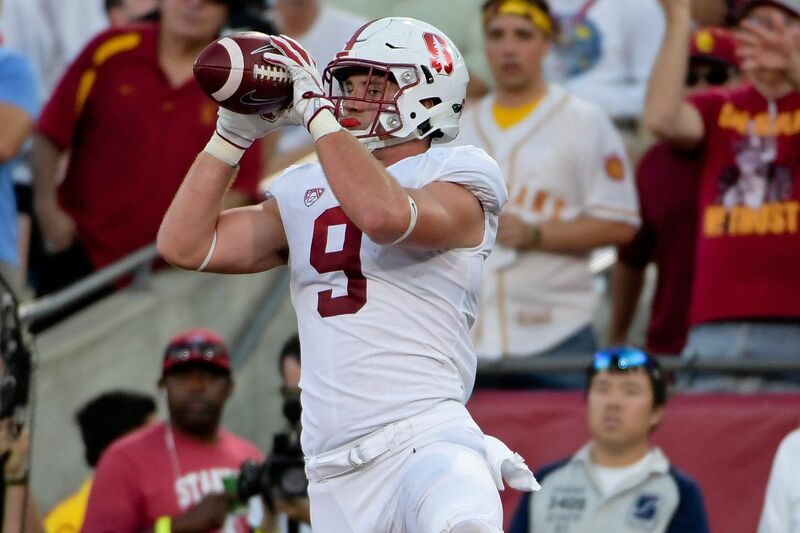 Stanford’s Dalton Schultz and Notre Dame’s Durham Smythe are two great options. I’m going to study Washington’s Will Dissly this week. — Use the middle and later rounds to bring in highly competitive, young defensive players. Speed, toughness, size, length, attitude — the foundation of Seattle’s initial charge under Pete Carroll. If the early rounds are rich for interior offensive linemen, running backs and linebackers — the later rounds will provide some options at cornerback, safety and D-line. 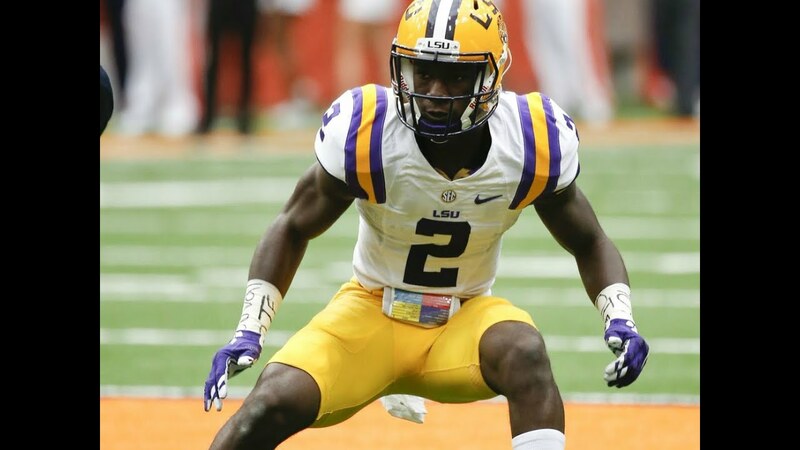 Would they work with a misguided talent like LSU’s Kevin Toliver at corner? He’s a former five-star recruit who might last into their preferred range for cornerbacks (R4-6). Will they find the athleticism of Virginia’s Andrew Brown, NC State’s Kentavius Street or Florida State’s Josh Sweat appealing? How early will Georgia’s Lorenzo Carter and South Carolina State’s Darius Leonard go? Is there a safety or two they like, possibly Jessie Bates III, Terrell Edmunds or Kyzir White for example? Is Kemoko Turay a great option to play LEO? And will they see new potential leaders in players like Ohio State’s Tyquan Lewis or Auburn’s Jeff Holland? — Create a proper competitive environment. The draft and free agency needs to be the starting point. Heated competition needs to return to Seattle across the board. Look at the way they churned in 2010 to find the initial pieces to build around. That continued deep into 2012 when Russell Wilson beat out Matt Flynn and Tarvaris Jackson to start at quarterback. It’s been a great run but with so many established starters, there wasn’t much room for competition apart from the jobs on special teams or deciding who was the fourth or fifth running back on the roster. True, legitimate competition needs to return. Multiple starting positions need to be up for grabs. — Lean on key players during what could be a transition year. The Seahawks under Carroll will never have an accepted ‘off year’. They will go for it every season. They also think long term. Change is coming and it’s time to find new stars and move on from some of the older players. It might benefit the Seahawks to have some new names fighting on the field to make an impression. They’ll still need to depend on some key veterans. Bobby Wagner, Doug Baldwin, Duane Brown and Russell Wilson could be tasked with this challenge. — A possible plan could be: R1 — OL or RB (Price, Wynn, Jones II), R2/3 — OL or RB (Ragnow, Corbett, Chubb), LEO or SAM/LEO (Turay, Carter, Leonard), R4 — TE (Schultz or Smythe), R5-7 — DL, DB. This would obviously depend on picks being acquired. It would allow the Seahawks to address their running game early and add young talent to the defense. — Unlike in previous years, however, there’s still a lot of clarity needed before projecting what could happen. Who is staying/going? What picks are they going to have? That ‘plan’ above could look very different in a month. How much work does Seattle’s O-line require? It’s a complex question and there are many layers to the answer. It’s possible the existing group will grow and improve. Will they take a big step forward under the guidance of Mike Solari? Do some of the players, like Germain Ifedi and Ethan Pocic, just need time? And will Duane Brown’s veteran experience help bring things together? At the same time, you could easily build a case for making big changes. Is Ifedi ever going to be a long term solution at guard or tackle? Is Pocic good enough? Why were there so many errors and missed assignments? Does the responsibility lie with Tom Cable or do the players share the blame for not executing? Did the running backs contribute in making the O-line look worse than it was? We know Russell Wilson occasionally runs himself into trouble, so how many bad reads were the running backs making? You could write a piece arguing absolutely anything about the O-line and make it seem logical. Let Solari work with this group before judging, give Ifedi another year, bring in a veteran left guard, draft a left guard, blow the whole thing up and start again. Nothing should be off the table. They probably don’t want to re-start the whole thing. After all, they’ve spent so much. Justin Britt wasn’t just a second round pick, they’ve also given him a $9m a year contract. Ifedi and Pocic were first and second rounders. Brown cost a second and third round pick. Has any other team invested more in their O-line? This has been a concerted effort to fix a problem. And yet it remains mostly unfixed. The Seahawks have shown they don’t necessarily need the Dallas Cowboys O-line to succeed. Look at 2013. They do need a line that functions, however. One that isn’t a liability. And in the post-Marshawn Lynch era they can’t rely on a future Hall-of-Famer to make up the difference. A degree of ruthlessness is required. Brown will remain at left tackle. It’d make sense to let George Fant compete with Germain Ifedi at right tackle. They have some options at the position, so another high pick at tackle seems unlikely. Seattle didn’t run the ball well enough up the middle. If you look at the results running to the left or right, the difference between the Seahawks and Rams is minimal. Yet Los Angeles and Todd Gurley averaged 3.02 yards before contact running up the middle compared to Seattle’s paltry 0.82 yards (#31 in the league). That’s where the serious debate needs to happen, especially approaching a draft class filled with interior O-line talent. The first two or three rounds are really appealing at guard and center. If the Seahawks trade Earl Thomas for a first round pick, would anyone really argue if they spent their two first rounders on Billy Price and Isaiah Wynn? It’d be a serious infusion of talent to the interior. It might not be the best use of resources given what they’ve spent on the O-line already but would it finally solve a big problem once and for all? Such a scenario might be unlikely. Appealing but unlikely. Yet it’s the kind of conversation that is worth having. If they’re going to eat some bad contracts on defense in an attempt to get younger — do they need to eat some money and picks on the O-line to get better? Will anything aid the Seahawks more than the ability to field a dominant run game in 2018? Look what it did for Dallas in 2016. They didn’t have a star-studded defense but were still able to control games thanks to a creative, mobile quarterback, Ezekiel Elliott and a terrific O-line. Seattle has a proven track record of developing defensive talent. Would you bet against Pete Carroll being able to field a complimentary defense for a new, supercharged running game? It’s something to think about during this horrible pre-combine void. We’ve talked a lot about Wynn and Price. They along with Ronald Jones II are very appealing in round one if the Seahawks are serious about focusing on improving their running game. Wynn is without doubt the most unflappable offensive lineman I’ve watched since starting the blog nearly ten years ago. His senior year at Georgia was an exercise in calmness, control and sheer dominance. He isn’t a big physical powerhouse like Quenton Nelson, destined to be the second coming of Steve Hutchinson. He might be, however, an unheralded star at a time when the league badly needs solid and consistent O-line play. Wynn was the best player at the Senior Bowl. I’m not sure it was all that close. Jones II is as close to Jamaal Charles as you’ll ever find in a player. They are eerily similar. He’s smaller than Seattle has drafted for the position in the past yet he’s incredibly tough and physical. He’s a star in the making with a major X-factor very few players possess. I wanted to spend some more time today, however, talking about Price. We’ve discussed his physical traits and playing style before. He’s going to surprise people at the combine with his power and explosive athleticism. He plays at maximum intensity, launching himself into the game and setting the tone. He’s a relentless ball of power, occasionally playing with some reckless abandon but more often than not having the ability to play within the scheme and execute some very technical double teams and blitz pick-ups. If you watched Taylor Lewan against Seattle in week three and thought — ‘I want that type of O-liner on our team’ — Price has that kind of edge and nasty. There’s one other way he stands out though and this could be important for Seattle. Too often in the last couple of years there have been mistakes. Missed assignments, players not working as a collective group. Price is an organiser. So while he’d bring a toughness to Seattle’s O-line he might also help the group function. I’m not trying to suggest for a second that Justin Britt isn’t capable of this or is responsible for the mistakes that happen on the O-line. Britt might talk in a similar fashion when quizzed on this subject. After all, like Price he switched to become a guard. Yet having experienced Seattle’s errors on the O-line like everyone else for two years, you can’t help but listen to Price here and wonder if this is a solution. Can he come in, lead Seattle’s O-line the way he did Ohio State’s and avoid, to use his words, letting his boys ‘look like idiots’. Meyer calls Billy Price a cornerstone. He started his 51st consecutive game today. Said Price took over the locker room last week. Called him a lifelong friend. After an absolute shellacking by Iowa during the 2017 season, Price took it upon himself to deliver a crucial speech in the locker room after the game. Meyer has credited that speech as a catalyst for turning around Ohio State’s fortunes. They went on to win the BIG 10 and nearly qualified for the college football playoffs despite that hammering by the Hawkeyes. There’s an awful lot to like. He’s an organiser, he takes responsibility for the group. Maybe they need that type of leader? He’s also durable, starting well over 50 consecutive games at Ohio State. It’s the one big edge he has over Isaiah Wynn who is currently recovering from a torn labrum and won’t workout at the combine. The Seahawks have an opportunity to improve their much maligned running game this year. The options are there in the draft — this is a strong class at running back and interior O-line in the early rounds. There’s also enough defensive talent from round three onwards to feel comfortable waiting on that side of the ball. There’s even 2-3 really good blocking tight ends to further improve the running game. They’re probably going to be aggressive in making changes to the defense. It’ll be interesting to see how aggressive they are changing the O-line too. — Auburn finished the SEC season superbly. They built momentum, rallied after a difficult loss to LSU and suddenly became the team to beat. They absolutely hammered Georgia, then comfortably handled Alabama in the Iron Bowl. The two teams that eventually met in the Playoff decider — taken apart by Auburn. They managed it playing a very familiar brand of football to Seattle (at least the 2012-15 version). Point guard quarterback. Fearsome running game. Jacked-up defense playing with their hair on fire, flying to the ball. This was a band of brothers, playing together with all three units connecting. The defense danced, celebrated and set the tone. It was like watching the LOB in 2013. I remember thinking at the time — this is what the Seahawks used to be like. That energy, the physicality. It was a Gus Malzahn offense but at the heart of everything was a very classic combination of good running game and great defense. If they want to get back to that — tapping into that Auburn spirit could be a possibility. They’re not alone of course. Georgia got to the final with the same kind of ingredients. Alabama always play defense and run the ball. It’ll be interesting to see how many players the Seahawks cherry pick from those three schools. The player I wanted to highlight today is EDGE rusher Jeff Holland. He’s not the biggest (listed by ESPN at 6-2 and 250lbs) and it’s fair to say he’s not going to win Mr. Universe. He looks quite unremarkable in terms of his physique. He’s not the biggest or fastest. Yet every time I watched Auburn in 2017, he stood out. He finished the season with 10 sacks, 13 TFL’s and four forced fumbles. Holland is a high-intensity, physical, fierce pass rusher with quickness off the snap. For his size he isn’t a liability against the run. Not being the biggest, fastest or most impressive athlete might dent Holland’s stock. He might not be on Seattle’s radar as a consequence. Yet there is talent to work with here and Holland did as much as anybody to embody the spirit of Auburn’s charged-up defense. On the first play he chases down the running back on a pitch, sprinting from the left hand side of the line to the right. On the second play he bullies the tackle before slamming down the quarterback on a draw. That’s the same play from different angles (broadcast & all-22). Look at the way he chops his hands at the tackle and stays clean. Holland isn’t loaded with upside. He isn’t Frank Clark, Bruce Irvin or Cliff Avril. Unremarkable size and length. He probably won’t have an amazing combine. Admittedly, this would be a change of pace for the Seahawks. Against the bigger, stronger and quicker athletes at the next level, he might be less impactful. He’s still intriguing in the middle rounds and you wouldn’t bet against this guy. Maybe they need one or two overachievers? You’re not going to have to worry about him being ‘all-in’. He might be able to fill a leadership void down the line. And if the Seahawks are moving on without Cliff Avril and Michael Bennett, they’ll need to find some possible options to help the pass rush. — I haven’t spent much time studying him yet but I wanted to mention USC receiver Steven Mitchell Jr. He can be a ferocious and committed blocker. I’m not sure if he’ll be on Seattle’s radar but USC’s #4 kept showing up on Ronald Jones II’s runs. He had 644 yards and four touchdowns in 2017. He’s only 5-10 and 194lbs (per ESPN). Mitchell Jr is willing to hit though and do some of the dirty work. He seems to take a great deal of enjoyment from blocking (often celebrating after a key block). In SPARQ testing he managed a score of 107.34 with a 33.5 inch vertical and a 4.55 forty. He’ll need to run faster than that at the combine but based on his tenacity he might be a name to remember. 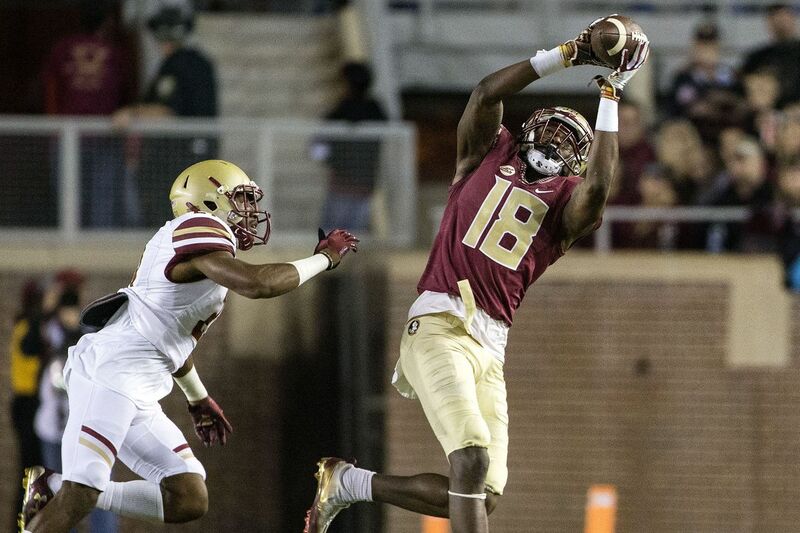 — Speaking of Ronald Jones II, there’s yet more evidence why he could easily be a first round target for the Seahawks. Fumble rates are very important. Dane Brugler has worked out how each running back in the draft ranks. Jones II has the third best fumble rate in the class. Ball security is key and it’s another big positive next to his uncanny similarity to Jamaal Charles (also note LSU’s Darrel Williams at the top, a late round option for Seattle). To follow the full strand of Tweets in this review, click here. Jones II is a special player. In the past, with the Seahawks picking later in round one, we’d be having a conversation about him being off the board by their pick. We had similar conversations about Haason Reddick, Sheldon Rankins, Garret Bolles, Keanu Neal, Odell Beckham Jr and others. Players initially projected by the media as first or second round types but ultimately they go much earlier. Jones II, to me, is a legit top-20 prospect. — We’ve spent a lot of time talking about Derwin James but one more note won’t hurt. James was invited to participate in an online game of Madden 18 on the PS4 over the weekend. He accepted the challenge against a Florida State fan, noting he would donate a pair of his cleats if he was beaten. As you can see James won somewhat comfortably. The interesting thing is he chose to play as the Seahawks. It could be nothing. It could be something. Who knows. It’s February and there’s no harm in a bit of speculation to pass the time.